Post-operative care focuses on limb management and continued patient assessment. 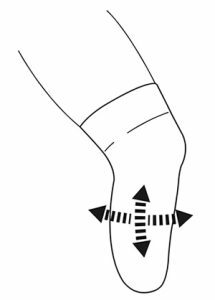 A clinical consultation is normally followed by the introduction of compression therapy, including commonly used textile shrinkers intended to manage edema and promote residual limb shaping. 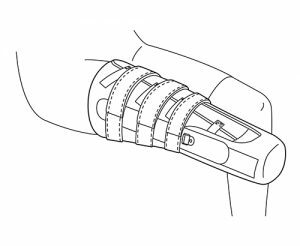 Additionally, there are traditional and non-traditional rigid dressings and complete prosthetic systems that can allow weight bearing therapies to be introduced. Following a lower or upper extremity amputation one of the initial steps on the road to recovery is compression therapy. Almost all surgical procedures will result in some form of swelling (edema) to the soft tissues which is a body’s natural protective response. This reaction is especially common following an amputation which is why compression therapy using a shrinker sock plays an important role. Before a prosthetic socket can be designed the limb must be shaped and swelling needs to be reduced and controlled. While an elastic “Ace wrap” bandage is sometimes initially used, their application can be difficult to consistently apply. A cloth shrinker, when pulled over the residual limb, provides a more consistent even compression gradient which will help to control swelling and promote shaping of the soft tissues especially at the end of the limb. Shrinkers are normally worn once the majority of the suture line is healed and most if not all of the staples and/or stitches have been removed. The shrinker sock should be worn at all times except when bathing. Throughout the day you will need to keep it pulled up to maintain a snug fit at all times. It is common in time to need a smaller size shrinker as your limb changes, so communication with your prosthetist is key. Once provided your initial prosthesis, limb volume reduction will continue. Most people experience the majority of limb shrinkage during the first year following surgery with gradual shrinkage (atrophy) occurring over time. These are occasionally used for those considered a high fall risk and are generally made of a semi rigid plastic materials. They are applied over the limb to provide protection from impact during walking activities. RRD’s are often used in conjunction with a shrinker sock and help maintain the knee in extension to prevent contracture development to maintain full range of motion. Make sure to contact your prosthetist at 757-595-9800 if you have questions regarding wear.